If your father says something you wish he hadn’t you can take the path of thinking it through. You can think to yourself, “Why did he say that to me?” (getting to the bottom of it) and “Boy that makes me mad when he does that” (choosing anger). You can really get into it. You can talk about it, think about it some more, express your anger, figure it out, and even go to talk to a therapist about how it makes you feel. Is this road justified? It is if you want it to be. You must, however, become conscious of exactly where this road is going to take you. The extent to which you follow this path will determine just how bad you will feel. The reason so many people stick to this path is because they know of no other. When they are on this path, they feel bad, and because they feel bad, it seems as through the world is causing their misery, so they think about it some more. The tendency here is to think that if you somehow think it through thoroughly enough, you somehow will feel better, and a vicious cycle continues. But feeling better is not a part of this path. On this path you are putting your attention and energy on the problem or what you don’t like about your life. This is not a source of satisfaction in your life. I don’t mean to suggest, however, that this path is never appropriate. Sometimes you really do need to think things through, analyze, compare, and even “Get to the bottom of it.” Sometimes it is appropriate to get mad and express your feelings. But ultimately the path to mental health requires you to release the problem or issue. The path of healthy functioning is nothing more than not taking the path of thought. When you’re engaged in healthy functioning you have a built-in protection against depression- which is knowing exactly what will happen if you go the other way. Choosing the path of mental health is a decision to respond to life in a way that allows a feeling of happiness to permeate your life instead of reacting to every negative thought that enters your mind. Let’s return for a moment to our example of your father saying something that you wish he hadn’t. If you were to choose the path of healthy functioning, this is what you would do. As soon as your head began to fill up with anxieties and questions about your father and his motives, you would immediately recognize that you were thinking. That recognition alone would alert you to the fact that you were now at risk to use your own thinking against yourself. You would begin monitoring your own thinking, not allowing your head to fill up with negative thoughts. As negative thoughts entered your mind, you would dismiss them. You would know that allowing yourself to focus on the negative thoughts would only hurt you—it would take you away from your healthy functioning. Here’s the benefit to you: with each negative thought that you dismissed form your mind, a nicer feeling within you took its place. As you felt better, you would regain your perspective and you would know exactly what to do next.You would either take some action such as discussing the issue with your father with a calm and loving attitude, or you would simply dismiss his comments and decide that its really not that big a deal. This entire process only takes a second and it all stems from knowing that you have a choice. Each time you practice this conscious choicemaking you will get better at choosing your healthy functioning—and you will decide that feeling good is worth the choice. this is all very nice… I guess I have to read the book to understand it deeper but isn’t a lot of the churning around in our heads precisely that not knowing whether we should act or not and if so how best to go about it? Many of the difficult situations we face do require a response, even inaction is a kind of response that has its own consequences, and yet what that response should be is not always apparent. I hear what you’re saying, but I can also relate to what the author is talking about. There is a kind of thinking that is an obsessive, anxious, negative kind of thinking about problems that ends up just leaving me stuck or making bad, panicky decisions. At those moments I know that if I can quiet my mind and get to a calm place, and stop thinking so much, then that will give me the clarity to make a good decision. This just happened to me today. I started getting all panicky and negative-thought-filled about a very important decision I need to make. And then I decided to stop thinking about it. And a few hours later, a good solution just occurred to me. I also enjoyed his book, “You Can Be Happy, No Matter What” which has similar powerful ideas. Here’s a great line, “You are just one thought away from a nice feeling.” He is most famous for his “Don’t Sweat the Small Stuff, and it’s All Small Stuff.” Sadly, he died suddenly at age 45. Sometimes u dont think about something but its there in the back of your mind its bothering u and when u acknowledge it and maybe think about it then u can move on your brain stops holding on to it. What do u think? 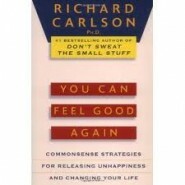 I have worked in mental health for over 30 years and only recently came across Dr.Richard Carlson. A client recommended that I read Stop Thinking – Start Living! I am amazed how simple his approach is but equally how effective it could be helping clients improve their mental health. Are there any mental health practitioners out there using this approach in therapy?